Emulsifying wax (contains cetostearyl alcohol and sodium lauryl sulfate), Chlorocresol, Purified water. None - Contains sodium lauryl sulphate - Over prolonged use it will strip the skin and actually cause dryness. I used this cream for many years, as it was recommend by my GP. My skin was getting increasingly dry during this time however, so I naturally kept on putting more on. Then i saw an article in the newspaper that said it was bad, and stopped using it. My skin has now gone back to normal. Scientists at Bath University found that aqueous cream thinned the skin after a few weeks of use. This is because it contains a detergent rather than just moisturisers. Professor Richard Guy said: "Our study has found that rubbing aqueous cream into the skin thins this protective barrier, making the skin more susceptible to irritation by chemicals. "So to use this cream on eczematous skin, which is already thin and vulnerable to irritation, is likely to make the condition even worse." Silky soft texture Moisturising Cleans well Leaves no residue Makes skin soft Got rid of my acne Cheap None I adore aqueous cream. It can be used as a wash and moisturiser, and has replaced all my other facial products. I was struggling with my acne and none of my (expensive) products were working. I suddenly had a really bad allergic reaction to one of my products, and my skin was cracking, itchy, and really dry. And my acne was just getting worse and worse. 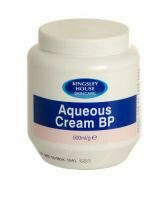 My Mum recommended me trying aqueous cream, as it can be used as a cleanser and a moisturiser, and is brilliant for extremely sensitive skin (can be used on eczema, and other skin conditions). It was great, and not only cleared up my skin reaction, but amazingly also got rid of my acne! I used to wake up with a new spot everyday, and have more by the evening, but since using aqueous cream I don't get any! At all! Plus my skin feels really healthy and soft, and has a lovely healthy glow. I will never go back, especially since it is also so inexpensive and yet works better than anything I've ever tried before. I've used ALOT of products in my time, but nothing has worked as good as this.